THUNDERBIRDS: Trapped In The Sky | Warped Factor - Words in the Key of Geek. Before the new 2015 Thunderbirds series gets underway Tom Pheby revisits some key episodes from the original 1960s classic, starting with International Rescue's debut adventure. 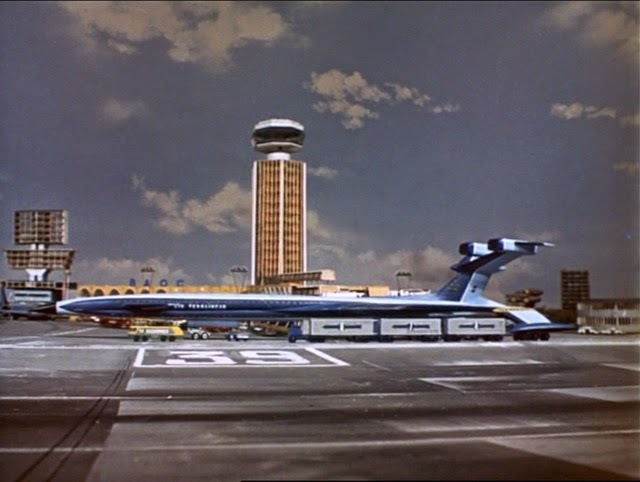 'Trapped in the Sky' was the first episode of Thunderbirds, screened on 30th September 1965. It's still highly regarded and considered by many to be the best from the series, and although I do think it is worth considering as such, there are others that I believe are better contenders. Plus it seems a trifle lazy just to say that the 'first one' is the best without bothering to assess the others which followed with similar vigor. 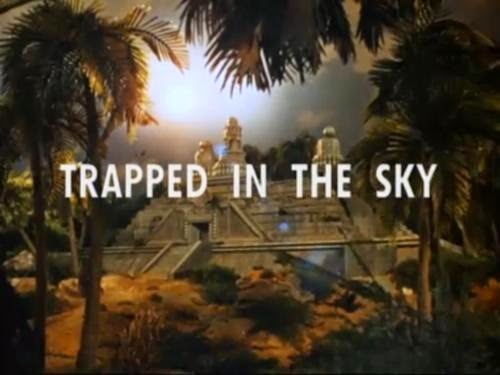 'Trapped in the Sky 'caused a numbers of headaches for creator Gerry Anderson after the original cut was shown to paymaster Lew Grade. Grade saw Thunderbirds potential immediately and announced “This isn’t a television series, it’s epic cinema!” And with that he demanded that Thunderbirds be increased in length from 30 minutes to an hour shows. Why the headache? Well the bulk of series one had already been written, and many of the episodes had even been filmed. Anderson would have to go back and rework the script to accommodate the increased running time, and shoot new seamless footage to make it work in its longer format, but he did have the benefit of an increased budget to facilitate the project. Originally Lew Grade (or Low Grade as I like to refer to him) had allocated the show £25,000 per episode, but he liked what he saw and increased that sum to £38,000. Although this seemed incredibly generous Grade would later squeeze Anderson until he squeaked to ensure the profits were to his liking. If Anderson was under any illusion of his employers thriftiness then he must have realised the truth after he was packed off to film at a trading estate unit in Slough in an effort to stop costs spiraling. Others may have wilted under the pressure and restrictions, instead Anderson's highly creative team brushed these matters aside and focused on making a high quality programme that appeared as if it had been made at Pinewood - but was more likely filmed behind Plywood. 'Trapped in the Sky' opens sedately enough with the villainous Hood in his Malaysian lair trying to exert his will on sibling Kyrano via telepathic link. Kyrano works for International Rescues founder Jeff Tracy, and the Hood wants to know if IR are operational. Once informed that it is, he places a bomb on the landing gear of a new supersonic jet called Fireflash. Fireflash flies at six times the speed of sound! Crumbs hold onto your in flight food tray! This is thanks to a nuclear fuel source on board. So with a bomb on the landing gear, if the jet is unable to land the passengers will suffer exposure to radiation. If it does land then it will blow up, which is clearly not good news for the passengers either! Coincidentally, one of the passenger's happens to be Kyrano's daughter Tin-Tin (no not that one). This scenario adds to the urgency of the piece. Of course the bomb is just a ruse to draw International Rescue from their secret hideaway location to obtain details of the individual craft, which one assumes will be sold to the highest bidder. All right, it would have been easier for the Hood to steal a blue print but Tracy Island isn't exactly on any Malaysian bus routes, nor is it accessible by bike. John Tracy, perched high in Thunderbird Five twiddling his thumbs in zero gravity, discovers there has been a failed attempt to remove the bomb and alerts Tracey HQ. Jeff then dispatches Scott, the puppet pin-up, to set up a command centre in London. After a short assessment Virgil is soon following with a pod full of life saving equipment. The Hood, who has eyebrows that even the Gallagher Brothers from Oasis might covert, manages to board Thunderbird 1 and take pictures via a camera in his hat. Scott is alerted to his presence, and the Hood quickly scarpers north up the M1, pursued by the police. When the authorities lose him, Lady Penelope and her lackey Parker are tasked with catching the happy snapper. In the meantime, Virgil deploys three elevator cars in formation to prevent the plane hitting the tarmac. The wheels begin to burn as they struggle to bring the plane to a standstill, which results in the intrepid Virgil dangling from his seat in the main car which gets unceremoniously upended. Some parts of this debut adventure are unintentionally amusing, and I love this aspect mainly because of it's purity and innocence. Firstly the Hood is obviously not bothered that anyone might attempt to locate the device, but just in case he has considerately placed the words "Auto bomb explosive unit" on the bright red cylinder. Secondly, the Fireflash Pilot decides to perform violent maneuvers to shake the bomb loose. Not the best idea in the world if I'm completely honest. Thirdly, the Control Tower at London Airport has an x-ray machine that can see inside a supersonic aircraft at top speed - wow! In the real world they can't even get planes in the air after we've had two flakes of Snow. Fourthly, London Airport looks like a wine bar and has about six passengers - wouldn't that be great at the height of the Summer Holidays. And finally, the Hood's pictures of TB1 feature pipes and logo's which he manages to secure without even moving his head or rearranging his hat. In truth all of these things just add to its undeniable charm and perpetuate our fondness for the show. It is beautifully filmed, and when you consider it was made fifty years ago it becomes even more remarkable, truly the work of a genius. There are things in this episode which become a template for the series, such as excerpts being shown at the beginning thus wetting the appetite for the impending drama. Then there's the rousing theme and pulsing score punctuating the action, and also the varied camera shots to capture every angle (epic cinema indeed). This tends to make Thunderbirds feel dynamic and bolder in scale, and the models seem more realistic. For an audience back in the 60's it must have seemed nothing short of spectacular.... even if it was made in Slough.